(Reuters) – A swine virus deadly to young pigs, and never before seen in North America, has spiked to 199 sites in 13 states – nearly double the number of farms and other locations from earlier this month. Iowa, the largest U.S. hog producer, has the most sites testing positive for Porcine Epidemic Diarrhea Virus: 102 sites, as of June 10. The state raises on average 30 million hogs each year, according to the Iowa Pork Producers Association. PEDV, most often fatal to very young pigs, causes diarrhea, vomiting and dehydration. It also sickens older hogs, though their survival rate tends to be high. The total number of pig deaths from the outbreak since the first cases were confirmed May 17 is not known. Researchers at veterinarian diagnostic labs, who are testing samples as part of a broad investigation into the outbreak, have seen a substantial increase in positive cases since early June, when data on the PEDV outbreak showed it at some 103 sites nationwide. The data was compiled and released last week by Iowa State University, University of Minnesota, Kansas State University and South Dakota State University. The virus does not pose a health risk to humans or other animals and the meat from PEDV-infected pigs is safe for people to eat, according to federal officials and livestock economists. But the virus, which is spreading rapidly across the United States, is proving harder to control than previously believed. In addition to Iowa, Oklahoma has 38 positive sites, Minnesota has 19 and Indiana has 10, according to the data. PEDV has also been diagnosed in Arkansas, Colorado, Kansas, Illinois, Michigan, Minnesota, Missouri, Ohio, Pennsylvania and South Dakota. Swine veterinarians, investigators with the U.S. Agriculture Department and others are trying to determine how the virus is spreading from farm to farm and state to state. Currently the focus is on the nation’s livestocktransportation system. PEDV is spread most commonly by pigs ingesting contaminated feces. Investigators are studying physical transmission, such as truck trailers marred with contaminated feces, or a person wearing dirty boots or with dirty nails. While the virus has not tended to kill older pigs, mortality among very young pigs infected in U.S. farms is commonly 50 percent, and can be as high at 100 percent, say veterinarians and scientists who are studying the outbreak. The strain of the PEDV virus that is making its way across the nation’s hog farms and slaughterhouses is 99.4 percent similar in genetic structure to the PEDV that hit China’s herds last year, according to the U.S. researchers. After PEDV was first diagnosed in China in 2010, it overran southern China and killed more than 1 million piglets, according to the Centers for Disease Control and Prevention’s Emerging Infectious Diseases Journal. No direct connection has been found between the U.S. outbreak and previously identified outbreaks in Asia and Europe, say scientists and researchers. Want to know what is happening to your ammo? “If ATFE were accurate, then a ten-cent bullet could penetrate a $5 million Abrams tank,” he said. “Obviously this makes little technical sense.”“What makes a bullet armor piercing along with the caliber, full metal jacket brass is the projectile of the bullet, not the inner core,” he said. “We secured a deal between an international supplier and an American wholesaler for four million rounds of ammunition used typically with semi-automatic rifles, after a three-month intense negotiation process that started in January,” said Melé. After the deadly Dec. 14 shooting at Sandy Hook Elementary School in Newtown, Conn., that resulted in 26 deaths, including the lone-gunman in, President Barack H. Obama Jr. called for immediate action and concrete gun control policies. Melé, who studied international diplomacy and international conflict management at Vermont’s Norwich University, said they suffered a significant loss due to the anti-Second Amendment antics of the Obama administration, which have a hidden agenda of disarmament. Republican lawmakers in the Senate and House of Representatives introduced a joint bill in late April that would limit the amount of ammunition federal agencies, except for the Department of Defense, are permitted to purchase. “The Obama administration has prevented Americans from obtaining the very same rounds that the government is buying,” Melé said. “Some would opine that the steel core bullets are the dreaded cop killer ones, but that too is inaccurate when the projectile disintegrates on impact,” he said. Teflon-coated bullets, sometimes colloquially known as ”cop killer bullets” are covered with a coating of polytetrafluoroethylene. Developed in the 1960s for improved penetration against hard targets, the product was discontinued in the 1990s. “After the Sandy Hook tragedy, ammunition supply decreased dramatically,” said Enrique A. DeJesus, who is a U.S. Air Force veteran and avid sportsman from Rotterdam, N.Y.
“I prefer to support my local gun store American Shooter Supply before looking elsewhere, but the situation is basically the same wherever you go,” he said. Price gouging is when a seller prices goods much higher than what is considered reasonable or fair. “As a result, firearms enthusiasts have to decide whether those high prices are worth it,” he said. “While defensive ammunition is readily available versus the scarcity of target ammunition, it is more expensive and contains hollow points which expand upon entry and are not ideal for training purposes,” he said. “Target or ball ammunition contains a solid projectile which does not expand upon entry and is better suited for training. Currently these are the hardest to find,” he said. DeJesus said that the exercise of our Second Amendment right has been temporarily neutered because of an artificial ammunition shortage. “As a responsible and lawful gun owner, safety is paramount when handling firearms of any kind, but politicians and officials in Washington D.C. should not be in the business of determining which ammunition I train with,” he said. “It is disconcerting to know that the federal government wants to keep ammunition out of the hands of law abiding civilians.” said the International Defensive Pistol Association member. IDPA is a shooting sport that teaches members how to effectively respond in self defense scenarios and real life encounters. “If DHS can have ammunition, why can’t we?” he asked. The Senate has heard America’s demands for improved border security… and used them as an excuse to hastily rewrite the Gang of Eight immigration bill, stuffing it with untold loopholes and nuggets of pork, before setting up a deliriously hasty vote on Monday. That’s right, folks: we’re going to get another vote on a thousand-page bill no one has read in its entirety. As then-House Speaker Nancy Pelosi famously remarked about ObamaCare, we’ll have to pass amnesty to find out what’s in it. Even Bill Kristol of the Weekly Standard, who is favorably disposed toward comprehensive immigration reform, called for Republicans to slam on the brakes before rushing another ObamaCare-style disaster through a quickie vote. Appearing on Fox News Sunday, Kristol noted that this isn’t about adding the 200-page border security amendment authored by Senators Bob Corker (R-TN) and John Hoeven (R-ND) to the existing 1,200-page bill senators have (presumably) been given enough time to read. Instead, the Corker-Hoeven amendment was ground into legislative powder and sprinkled throughout the bill, altering it in countless ways that no one really understands yet. Every page of the bill is now like one of those everything-flavored jelly beans from “Harry Potter”: we have to swallow it to discover what it tastes like. Shoving this hot mess through the Senate without allowing at least a week or two for senators and their constituents to study the revised text is madness… and it seems like a violation of Senator Marco Rubio’s (R-FL) promise that “I don’t want to be part of a process that comes up with some bill in secret and brings it to the floor and gives people a ‘take it or leave it.’” There’s nothing open or transparent about shoving a mystery bill down America’s throat without time to study or debate it. Although the revised bill has only been available for public review since Friday, a few interesting little surprises have already been discovered. The Heritage Foundation spotted “several sweetheart deals” buried in the new text, including “special treatment for Alaskan seafood processing and $1.5 billion for youth job training.” Senate Majority Leader Harry Reid (D-NV) slipped a juicy bit of pork for his Vegas gambling connections into the security portion of the bill, by indefinitely extending a $100 million program to promote tourism, which was slated to end in 2015. What the hell does that have to do with border security – or immigration reform, for that matter? This isn’t about statesmen crafting legislation with a careful eye towards its profound impact on our national welfare; it’s thieves in the night scurrying away with bags of taxpayer swag before anyone has a chance to call the cops. So we’ve still got amnesty now, border security whenever. We’re still talking about these silly, easily-disarmed “triggers” instead of requiring ironclad improvements first – which should encompass not just the physical security of the southern border, but internal security as well. The Corker-Hoeven amendment has very little to say on that subject, beyond a vague promise to get more serious about tracking visa overstays. Now there’s a problem whose persistence makes a mockery of the whole “secure borders” posture. The same government that resists all efforts to clean up its voter registrations is going to use advanced (but not state-of-the-art) identification systems to crack down on a problem that any respectable 18th-century bureaucracy could have handled – namely, people who don’t depart the country on schedule when the visas they obtained from the U.S. government run out? There’s some significant resistance to the modified Senate bill, including a call from the Immigration and Customs Enforcement agents’ union to vote the bill down, because it’s too lax on internal security, allows too many gang members and other criminal aliens onto the “pathway to citizenship,” and leaves too many important issues at the discretion of bureaucrats. Sessions noted that the promised 20,000 new Border Patrol agents in the Corker-Hoeven amendment “are not required until 2021,” and “no money is being appropriated for that… this is merely an authorization,” while its promise to build more border fencing is actually weaker than the existing law Congress passed years ago, then largely ignored. As Sessions pointed out, the construction of more border fence is comically left entirely at the discretion of Homeland Security Secretary Janet Napolitano, who has loudly stated that she has no interest in building any more fences. The 1986 act didn’t turn illegal immigrants into citizens on the spot. It granted temporary resident status only to those who could prove they had resided continuously in America for five years. After 18 months, their status could be upgraded to permanent residency, and only after another five years could they become U.S. citizens. But advancement to citizenship was not automatic. Immigrants had to satisfy various requirements along the way. They had to pay application fees, learn to speak English, understand American civics, pass a medical exam and register for military selective service. Those with convictions for a felony or three misdemeanors were ineligible. The ’86 reform bill also had supposedly “rigorous” border security and immigration law enforcement provisions. So how did that pan out? On the day Reagan signed “comprehensive” reform into law, only one thing changed: Millions of unlawful immigrants gained “legal” status. The promised crackdowns on security and enforcement never happened. Only amnesty prevailed. But if we got that combination of enhanced internal and external security first, there would be real up-front costs to pay. Increasing the deficit is problematic, and few in Congress wish to divert money away from politically profitable vote-buying programs to fund the thankless task of border security. Furthermore, when the time for legalization finally arrived, there wouldn’t be 12 million illegals to grant amnesty any more – their numbers would have been reduced through more aggressive enforcement of existing law. And that would be a problem for some of those pushing this mutated Gang of Eight bill. They’re also really looking forward to passing something that House Republicans can be forced to shoot down, creating a great opportunity for racial demagoguery going into the 2014 midterm elections. A sloppy bill passed by blindfolded Senators is just the thing to fulfill all those political-class ambitions, but there’s no reason the rest of America should go along with it. Update: Look what else just popped out of the revised immigration bill: a $1.5 billion “stimulus” boondoggle, based on one of President Obama’s failed big-spending “jobs bills.” It got tossed in as a sop to avowed socialist Bernie Sanders of Vermont. Doubtless many more delightful surprises that have nothing to do with “border security” await us as we chew on those Corker-Hoeven everything-flavored magic jelly beans. Update: Guess who else gets a pork-fried handout in the revised immigration bill? Hint: they’re incredibly rich, hyper-liberal, are known for the kind of business practices they claim to hate. When I was a kid…everyone in the country drove around with rifles and or shotguns in the racks in their pickup trucks…. It is cities and the metrosexual untrustworthy culture that is the problem with gun violence….Ban Cities! On Thursday night, the host of “The Daily Show” riffed on Paula Deen’s liberal use of both butter and racial slurs, chatted about journalism with Tom Brokaw and parodied the gangster code of honor that has been in the news in the Whitey Bulger trial. Along the way, he did a honey-dripped Southern accent and dropped into a Cagney-esque wiseguy voice. John Oliver, who is hosting “The Daily Show” this summer, is one of many British imports gaining visibility in American media. Mr. Oliver is filling in for Jon Stewart, who is directing a film this summer. We could dwell on the oddity of a British comedian replacing the host of a deeply American show, except that everywhere you look in the United States media landscape, you find people from that small island. Piers Morgan came from Britain to take over for Larry King, The Wall Street Journal is edited by Gerard Baker, a British newspaper veteran, and the chief executive of The New York Times is Mark Thompson, who spent his career at the BBC. Anna Wintour has edited Vogue for more than two decades and, more recently, Joanna Coles took over Cosmopolitan, which defines a certain version of American womanhood. NBC News recently looked to the mother country for leadership and found Deborah Turness, the former editor of Britain’s ITV News. ABC’s entertainment group is headed by Paul Lee, also formerly of the BBC, and Colin Myler, a Fleet Street alum, edits The New York Daily News. The list goes on, but the point is made: when it comes to choosing someone to steer prominent American media properties, the answer is often delivered in a proper British accent. The observation about the thicket of British talent has been made elsewhere and is hardly a brand new phenomenon — it’s Tina Brown’s and Nick Denton’s world, we just surf it. But something is at work here, beyond the joke about a British accent adding 10 I.Q. points. If that’s so, then the renewed British invasion on our shores makes sense because media are becoming more competitive and less mannered with each passing day. Apart from the fact that Mr. Oliver is a very funny man, “The Daily Show” continues to storm along partly because, like Mr. Stewart, Mr. Oliver suspects everyone and everything and says so aloud. Other dynamics are at play as well. The dividing line between the business and editorial side in British journalism has always been thin, and those who rise to the top have a good grasp of numbers. That’s a characteristic that is increasingly prized in corporate America. And an endless supply of talent is seeking to leave the crab pot of British news media because they want to work on a larger scale. Ms. Coles is a former reporter at The Times of London who came to work in the United States for The Guardian before going to New York Magazine. She went on to More magazine, Marie Claire and now runs Cosmopolitan. I crossed paths with her when we both worked at New York Magazine, where she stuck out for reasons other than her accent. To wit: while the rest of us would nod assent when senior editors spoke, she frequently argued points to the point of impertinence. “I was taken aside and asked why I was doing that and I said, ‘Doing what?’ ” she recalled when I spoke to her last week. From her perspective, she was doing what all good journalists do, which is pushing back. With more than a dozen newspapers that compete for national attention and a publishing model that is based on appealing to readers far more than advertisers, the British news media market is a brutal and competitive crucible; it breeds frankness, excellence and a fair amount of excess. In that context, American journalism’s historical values of objectivity and fairness seem quaint. And with point-of-view increasingly included in more contemporary forms of media, the British are ahead of the game. Ms. Coles also pointed out that in the United States, there are discrete spheres of influence. Los Angeles, New York and Washington all have their domains, while in Britain, there is only London, a place where entertainment, politics and news media all live in the same petri dish. More so than in America, journalists end up on television and politicians are often drawn from the ranks of news media. As the hacking scandal revealed, it’s a very small tree house in which the various elites not only know one another but socialize as well. Newspapers and radio still play a central role in the civic life of Britain, and Parliament is a kind of gladiator pit that can make Congress seem like a Montessori school. Greg Gutfeld, host of “Red Eye” and co-host of “The Five” on Fox News, is the rare American who reversed the polarity, having been drafted to edit Maxim in Britain from 2004 to 2006. His newsstand numbers, the only ones that matter there, weren’t great, but he learned a few things. In a cluttered informational economy, communicating in pithy, seductive ways is a matter of survival. So the demand for British editorial imports will stay high. As anyone who has ever attended a wedding at which Brits and Yanks are trading toasts can tell you, the English know what audiences want and how to deliver it. Cheers, mate. Now why would jobs for Americans have to be added to immigration bill???? Opponents of the Gang of Eight immigration bill have spent the weekend looking for hard-to-find changes in a piece of legislation that was substantially re-written by the Hoeven-Corker amendment. But there’s one big change that’s right out in the open — impossible to miss, in fact. The original Gang bill ended with a section designated Title IV, which was headlined REFORMS TO NON-IMMIGRANT VISA PROGRAMS. The Hoeven-Corker version of the bill added a Title V, with the headline JOBS FOR YOUTH. The measure would provide $1.5 billion in the next two years to provide jobs for Americans between the ages of 16 and 24. It was originally pushed by Democratic Sen. Bernard Sanders, who wanted to come to the aid of young workers who were “hard hit by the Wall Street-caused recession.” Now, Sanders says immigration reform will further damage youth job prospects. In the few days of Senate debate over the Gang of Eight bill, Sanders delivered several floor speeches that were almost bitterly critical of the legislation’s economic effects. The bill will cost jobs and reduce the standard of living of millions of low-skilled Americans, Sanders argued. His was the most vocal and persistent criticism of the bill from the left. Sanders’ amendment is entirely consistent with positions he has taken over many years. The only odd thing is that his proposal would be included in an amendment offered by two Republicans, John Hoeven and Bob Corker. Do they endorse Sanders’ policy positions? On the one hand, a critic could ask what business lawmakers have recycling provisions from the American Jobs Act as new additions to a sweeping new immigration reform bill. On the other hand, one could argue that the Sanders addition is an attempt to counter some of the economic damage the bill’s sponsors will not admit it will inflict. In any event, Sanders’ project is likely to be part of the massive bill that wins Senate approval by the end of the week. Civil Rights movement? Yes…for NATIVE BORN AMERICANS!!!! With the Senate set to approve its White House-backed bill this week, Senator Charles Schumer, an author of a bipartisan bill that would allow about 11 million immigrants to eventually become U.S. citizens, said he expects House Speaker John Boehner will soon have “no choice,” but to let pass a Democratic-backed immigration bill. 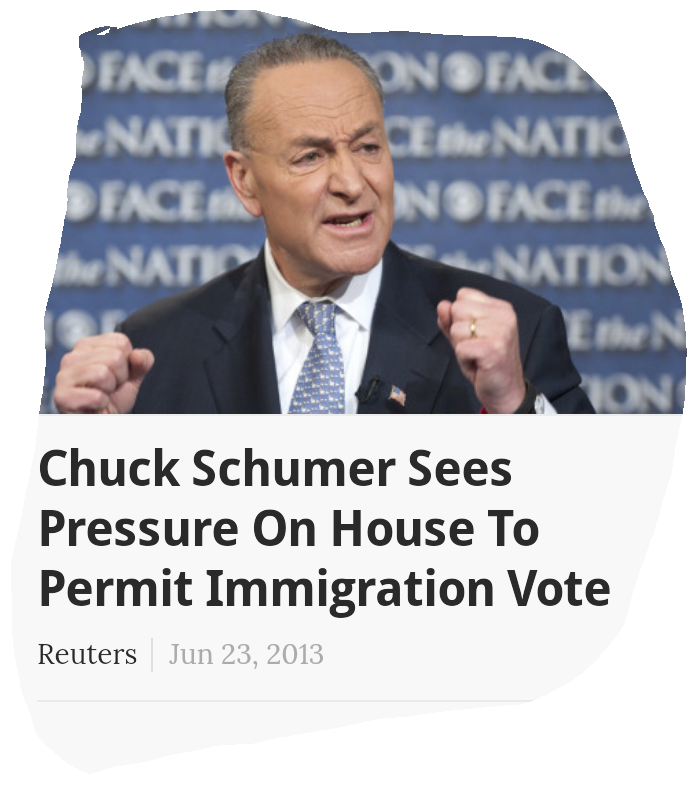 However, if Boehner tries to bottle up a bill that includes eventual citizenship, Schumer said, “I could envision in the late summer or early fall … a million people on the mall in Washington,” demanding action. Schumer told CNN’s “State of the Union,” conjuring up memories of rallies in the 1960s that resulted in landmark anti-discrimination and voting rights legislation for African Americans. Schumer is the third ranking Democrat in the Senate. Boehner’s Republican Party has said it needs to support comprehensive immigration reform to make the party more attractive to Hispanics, the fastest growing U.S. voting bloc. Yet Boehner, facing pressure from many of the House’s most conservative members, said last week that he would not bring any immigration bill up for a vote unless most Republicans back it. A Senate test vote is set for Monday, with passage of the bill expected on Thursday. Strong bipartisan Senate support was assured last week when a $40 billion deal was reached to double to about 40,000 the number of federal agents on the U.S.-Mexican border, and obtain a crush of additional high-tech surveillance equipment, including planes, drones and radar. Up to 70 or more of the 100 senators are expected to vote for the bill, including all 52 Democrats, both independents and perhaps 16 or so of the 46 Republicans, according to aides for both parties. With passage virtually assured, the Senate immigration battle is now essentially over with the focus shifting to the House where it remains unclear what will happen. We need to work to stop this bill…. Many Republicans oppose the proposed pathway to citizenship, denouncing it as “amnesty” for law breakers that will attract even more illegal immigrants. Backers reject such talk, noting that the 13-year pathway would require undocumented immigrants to pay back taxes, learn English, hold a job and pass criminal background checks. They also argue that the pathway would draw undocumented immigrants from the shadows, where many are now abused, and help make them a productive part of the American way of life. Speaking on CNN, Paul said many agree with him that there should be evidence that bolstered border security has reduced illegal crossings before anyone can begin a pathway to citizenship. Under the Senate bill, there is no such requirement. Republican Senator Mike Lee, like Paul, a favorite of the conservative Tea Party movement, said his chief problem with the Senate bill is the sequencing of events. “The pathway to citizenship begins basically on day one. But it will take many, many years, if not decades to fully implement all these border security measures,” Lee told Fox News Sunday. The deal to implement additional border security was reached after the Congressional Budget Office estimated that the initial bill would reduce illegal immigration by just 25 percent. Republican Senator Lindsey Graham, a member of the “Gang of Eight” that wrote the bipartisan bill, hailed the added security. “We practically militarized the border,” Graham told Fox TV.